Food alert for South people. 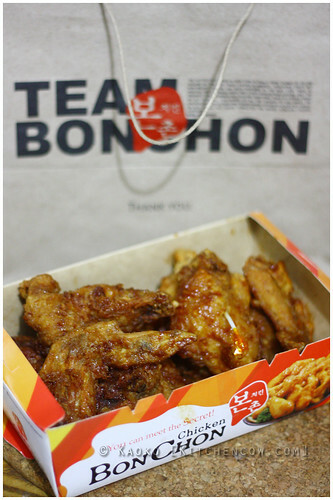 Alabang Town Center’s Bon Chon Chicken has finally opened! Find it at the new wing, among the newly opened shops. I haven’t been there, but according to Pad’s report, the shop is a bit small so expect long lines. But who cares? This is Bon Chon we’re talking about! Pad’s surprise. Best. Pasalubong. Ever. If you’re like me though, the ideal gameplan would be to grab a box of wings to go and enjoy at home. Because of their wonderful chicken frying technique, the wings remain light and crunchy even through the long drive home. Granted that you can resist nibbling them in the car. The photo above? It’s a sign of future weekday dinners in our household. I haven’t tried Bonchon but I heard it’s one of the best. I’ve been passing by their new branch in atc and its always busy, packed with customers. My friend wants me to try their Fish Tacos. I also can’t wait for Banapple to open beside Bonchon!